The Preferences settings let you set options for general functions. 1 In the Setup dialog box, click the Preferences tab. · Always start from beginning: Resumes playback at the start of the disc. · Always start from last position: Resumes playback at the point where the disc was stopped. 3 In Player Preference, check the Start from full screen mode to launch DVD in full screen mode. 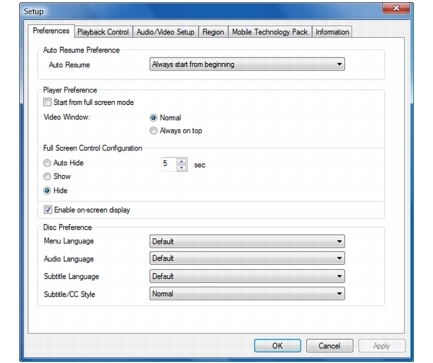 Choose either Normal or Always on top to set the display behavior of the video window. · Auto Hide: Automatically hides the Player Panel and Caption Bar after a period of no mouse activity. You can indicate the number of seconds before the Player Panel and Caption Bar are automatically hidden. · Show: Displays the Player Panel and Caption Bar in Full Screen mode. · Hide: Does not display the Player Panel and Caption Bar in Full Screen mode. Check Enable on-screen display to show control panels and other information on screen. Also known as OSD, on-screen display lets users to view information or select options. 5 In the Menu Language drop-down menu, choose the default menu language. 6 In the Audio Language drop-down menu, choose the default audio language. 7 In the Subtitle Language drop-down menu, choose the default language for subtitle display. 8 In the Subtitle/CC Style drop-down menu, choose either Normal or Transparent option. · Normal: Subtitles will appear in their original state. Transparent: Subtitles will appear as slightly transparent.